By virtue of a thrilling win over St Mary's last November on a terrible winters day, our U-14 boys had the honour of representing our club, and county at the All Ireland Feile competition held this year in Derry to honour its celebration as European city of culture. The final whistle had barely sounded in Tourlestrane that afternoon, before families and supporters of the victorious team were trawling the internet looking for accommodation in close proximity to Derry City for the last weekend in June. Indeed many people pencilled in that weekend and organised their holidays around the festival of Gaelic football that was to be on show. This is expected to be the last year that this competition will take place in its present format, a change mooted by Christy Cooney the outgoing president of the GAA and taken on board by Liam O’Neill when he took office last year, so as a club we were determined to leave an indelible mark on the competition and make the experience one to savour for the players involved. When the evenings began to lengthen in late spring it was time to start talking about the upcoming adventure and surely when team captain Evan Lavin spoke about going to Feile on Ocean FM during our club focus programme, it was time to call a meeting of parents to gauge the level of interest and start planning. There was a 100% turnout of parents at the meeting and several ideas were discussed. The raising of money had already started, as at a previous club function (finale of Operation Transformation) a very successful raffle yielded a profit of 600 euro and Brendan & Marie Mc Hugh of Mc Hugh Express confirmed their intention to sponsor kit bags. When Edward East mentioned that he would like if his premium sponsorship money was used for this venture also, we knew we were up and running. The most popular fund-raising idea was the tried and tested fun walk, although the players would have preferred to shave the coaches eyebrows or be someone’s “slave for a day”. Sponsorship cards were printed and the players were quite eager to participate as they knew every euro raised was going to their trip. Using various modes of transport i.e. walking, cycling, car and even horseback, the players scoured the area in search of sponsorship. Aunts, Uncles, Godparents that they might not have been that fond of before this were suddenly visited and the card produced before they made their exit. The result of their endeavours was a whopping €2600 euro. This coupled with the generosity of parents, some anonymous donations and the aforementioned raffle, brought the takings up to €4k, which far surpassed even the most optimistic forecast. Meanwhile in the background endless hours were spent, primarily by Shaun and Damien looking for good quality merchandise at affordable prices and it was great to be able to shop local as John Lavin was able to supply all our needs. Next up came confirmation of our host club who would look after our players for the weekend and when word came that we were going to Rasharkin in Co Antrim it was a case of once again pulling out the map or for the iPhone users - a quick search on Google. We wish to acknowledge the phenomenal amount of assistance our coaches received from Paddy Kelly (our liaison officer in Rasharkin) in the weeks and months prior to Feile, as emails were exchanged at all hours of the day and night. The night before our journey was a special one as each player received an embroidered Eastern Harps crested T-shirt, a full track suit and the aforementioned kit bag. We also had a new set of club jerseys. We departed at 9am the following morning and arrived at our destination at approx. 2pm, the journey having taken a little longer than expected. We were welcomed by our liaison officer Paddy Kelly, who like many others has several titles/positions in the GAA world and Ciaran Hasson, who proved to be an excellent tour guide and photographer over the weekend, taking a massive 2894 photographs, which he kindly forwarded to us. Now approaching throw-in time for our first game, lots of parents began to arrive who were all treated to complimentary refreshments which were very welcome and gave us an indication of the fantastic hospitality that was in store for us for the weekend. We got off to an excellent start and won our first game against a very young but resilient Rasharkin side. The most pleasing aspect was to see James O’Hara come through unscathed as he had been an injury doubt all week and we were already without Aaron Burns, who has been injured most of the year. Jake Stephenson who cut his holiday short to fly in to Belfast arrived just before the throw in, sporting a bronze tan that made many people wonder about his nationality. Other fine performances came from Fionn O’Donnell Stephen Higgins and Daniel Tansey in attack, while in defence Luke Taheny, Oskar Grzenda and Sean O’Connor played pivotal roles. This win got every ones spirits up and then it was on to Celtic Park for the Feile parade through the streets of Derry. Lack of sleep from the night before and the excitement of the adventure began to take its toll and Ciaran Dorrian and Shaun O’Hara slept soundly on the bus journey to the city. In the sunshine in Derry’s main stadium there was a sight to behold - Four thousand children and their mentors all decked out in their club colours sitting on the grass waiting for the parade to begin. Our lads at first were cautious, but then started chatting with players from their host club and then as they got more confident began to seek out the other clubs in their group who they would be playing the following day and they had the audacity to look for individual players that they expected to be marking in those games. Even Club Chairman Padraic Henry, who took a well-earned break and joined the U-14s for the trip to Derry, got in on the act and could be seen networking with the big names like Anthony Tohill, Joe Brolly and co. He even drank tea with RTE reporter Tommie Gorman over the weekend!!!! The GAA president Liam O Neill strolled around the site of this rare spectacle in Celtic Park and was happy to stand in for a photo with us before the parade commenced, and later presented our captain Evan Lavin with a memento of our visit to Derry. Back to Rasharkin and the families of our host club were ready to bring our tired players home for a well-earned sleep as we were back on the road the following morning at 7.30am. Slaughtmanus was the venue for our final two matches and we first played the home team winning that game also. A titanic battle between Cian Higgins and his marker stood out in that game where our forward was the recipient of some terrible challenges, however it didn’t bother our man and he kicked wonderful scores. Evan played a captains part and others to shine were Shaun O’Hara, Michael Conlon, Luke Kielty and Kaelum Byrne. From the subs bench Gavin Gardiner came on and in typical Gavin fashion scored a point with his first touch. However the victory was marred somewhat by an injury to Ciaran Hannon that finished his weekend. He was having a good tournament and we wish him a speedy recovery. Circumstances out of our control dictated that we had to play our final game immediately after the Slaughtmanus game, a situation that was not ideal as our opponents St Lomans were bathing in the sunshine watching us while we played out our game. We needed a good start and were unlucky that Ciaran Dorrian and Finley Daly were both denied goals in the first half as we played with the wind. Still, at half time we were only down by a few points but tiredness caught up with us in the second half due to our exertions in the previous game and Lomans ran out comfortable winners. The loss no way reflected on the excellent goalkeeping of Colin Dwyer and Jonathan East was a massive influence, first at the edge of the square and then when moved further outfield to try and thwart the oppositions attack. Bryan Molloy, Tomas Taheny and Eoin Dwyer all played their heart out but on this occasion had to settle for second best. In the skills competition the width of the crossbar prevented John Cosgrove from attaining 2nd place as his fisted effort at a score fell agonisingly short but he can look back at his contribution and be immensely proud of it. We returned back to our base and along with families and supporters from both clubs enjoyed a lovely dinner where we were the recipients of a beautiful framed Rasharkin jersey that will take pride of place in our own clubhouse. Paul Dwyer returned the compliment with a souvenir from our club. At this stage we were beginning to notice how our host club were going far beyond what was necessary for a host club to do, as Rasharkin jerseys, T-shirts and money was being given to our lads in an extraordinary outpouring of generosity, and some of our team even finished up at host families birthday parties that were being held. In a hastily convened meeting our coaches decided to wait and support our Sligo senior team in the following days match against Derry to be staged in Owenbeg, as the club are immensely proud of Ross Donovan who captains our county team and Kevin Cryan and Tony Taylor who were also on the panel. To fill in the early part of the day we challenged Rasharkin to a fun match in their pitch and afterwards to be our guests for lunch. They gladly accepted our offer and when the players were safely back at the host families on Saturday night, the rest of us were up until the small hours exchanging cross border stories about our clubs and the GAA. Sunday mornings match proved to be extremely popular and with the teams deciding to mix themselves, we had sights like Eoin Dwyer, Luke Taheny and Stephen Higgins playing in the home team’s colour of primrose and blue and the famous Harps jerseys being worn by players from Co Antrim, which surely was a first. The highlight of this game was the outstanding performances of the referees!!! In the first half the Harps referee gave an astonishing 3 penalties to one team, each of which was missed, which in itself must be a record and if he had remembered to bring his note book Gavin Gardiner would surely have been the first man in it for persistent annoyance and complaints to the referee. The game was high in entertainment value and kept the vocal crowd amused. The 2nd half was refereed by a local Rasharkin mentor and showing a lot more bottle than his first half counterpart, he promptly sent a player to the line. To make matters worse he ignored the advice of his two umpires and gave a goal to level the match when it appeared that the ball was at least 6 foot wide. Rasharkin badly need to invest in Hawk eye technology. Following on from the match we once again convened at "The Wild Duck Restaurant" for lunch, which was once again beautiful and so we asked for plain sandwiches for the players for the homeward journey. This turned out to be a big mistake as even though the sandwiches were fine they certainly were not plain and were the source of great amusement to the players as they all looked for ham sandwiches on the road home knowing quiet well that we didn’t have them. 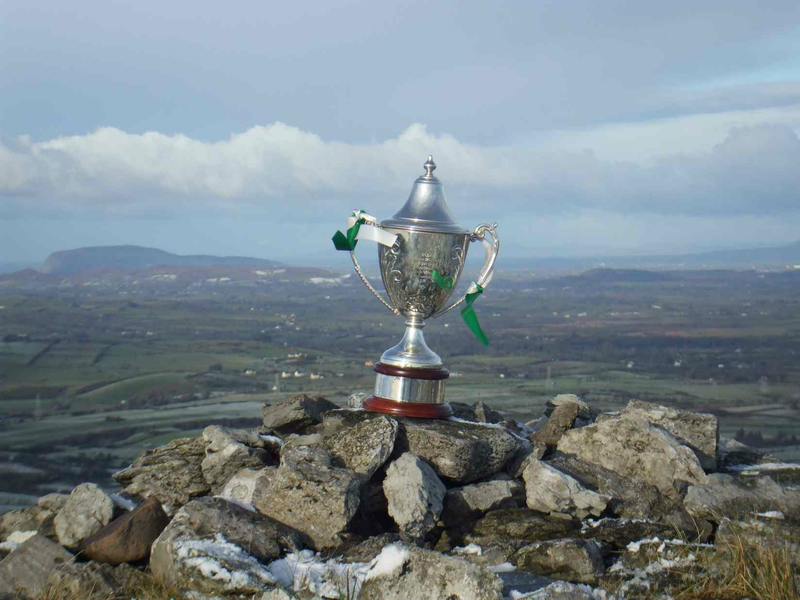 Our club secretary Padraic Duffy had sufficient influence to get us great seats for the match in Owenbeg with no financial cost to anyone and afterwards we hit the long road home. We arrived back in Keash at 9.30pm and the bus driver must be complimented for his patience throughout the whole weekend and getting us to the various destinations with the minimum of fuss. We cannot let the weekend pass without mentioning the contribution of the younger female supporters of Aisling and Orla Dorrian, Emma Stephenson, Muirne O’Donnell, Ciara O'Connor and Roisin & Maeve Molloy for presenting the lads with 25 lollipops after they lost that final game. I am not sure did the lads appreciate the gesture but to the onlookers it was a very kind and generous act. But perhaps the highlight of the weekend and one of the reasons that we were embraced so well by our host club occurred on Saturday after Rasharkin had lost their third and final match leaving them pointless. In a spontaneous gesture by our coaches, all our players, parents and supporters formed a guard of honour and gave Rasharkin a fantastic ovation as they left the pitch. The Rasharkin players got very emotional and there was a tear in many an eye as players and mentors trooped off. The one tiny blip on the weekend was the disappearance of a small number of our new jerseys during one of the matches, but in keeping with all the goodwill of the occasion Damian & Fiona Tansey one of our Club premium sponsors immediately offered to replace the jerseys. We thank them for that. To conclude, the club wish to thank all who travelled to Derry for Feile Peil na nOg. The team did us proud both on and off the pitch and were wonderful ambassadors and greatly enhanced the reputation of our club. To the parents and supporters who travelled in such large numbers and are very supportive of this team and indeed the club, we are grateful. Also thanks to Aisling for all the photographs she took and updating the website/Facebook page on our return. And as for the coaches of Paul Dwyer, Eamonn Clarke, Shaun Dorrian, Colm Dufy and Damien Mc Govern, words cannot adequately describe the amount of work ye all put into this venture. The weekend went off without a hitch primarily due to your attention to detail. The club are indebted to you all and thank you not just on this occasion but for the time ye have given this team over the last year.